Huskisson E, Maggini S, Ruf M.
Physicians are frequently confronted with patients complaining of fatigue, tiredness and low energy levels. In the absence of underlying disease, these symptoms could be caused by a lack of vitamins and minerals. Certain risk groups like the elderly and pregnant women are well-recognized. Our aim was, therefore, to find out if other, less well-established groups might also be at risk. Thus, the objectives of this review are: to describe the inter-relationship between micronutrients, energy metabolism and well-being; identify risk groups for inadequate micronutrient intake; and explore the role of micronutrient supplementation in these groups. A review of the literature identified an important group at risk of inadequate micronutrient intake: young adults, often women, with a demanding lifestyle who are physically active and whose dietary behaviour is characterized by poor choices and/or regular dieting. Micronutrient supplementation can alleviate deficiencies, but supplements must be taken for an adequate period of time. Every doctor is familior wi1b the patient who presents complaining of a lack of energy. tiredness and exhaustion, and for whom thorough examination and even routine laboratory tests do not provide a satisfactory explanation for their symptoms. Without any underlying diseases, might these symptoms be caused by a lack of vitamins and minerals? Research in the latter half of the 20th century has dramatically increased our understanding of the biochemical processes of cellular energy generation and demonstroted the fundamental role of a large number of vitamins and minerals as coenzymes and cofactors in these processes. This paper is based on the recognition that a lack of micronutrients may impair cellular energy production, resulting in symptoms of tiredness and lack of energy. In the first part of the paper, we summarize the current understanding of the role of micronutrients in energy generation and discuss the implications of micronutrient deficiency for energy and well-being. In the second pent of the paper, we discuss the potential role of micronutrient supplements in improving the well-being of patients complaining of lack of energy and whether doctors should recommend such supplements. This review focuses on 'healthy' adults with active and demanding lives. It refers only briefly to athletes and sports performance, because comprehensive reviews about these groups and their specific needs can be found easily in the literature. For the same reason, we will also exdude very well-known risk groups. such as the elderly and those with vitnmin B12 and iron deficiency. Energy to power the body's metabolic processes is derived from the food that we eat. Various readions in catabolic pathways release this energy, and store it in the high-energy phosphate bonds of the body's energy storage molecule, adenosine tripbosphate (ATP). The process by wbich energy is transformed into ATP is known as cellular respiration (Figure 1). The main part of this cellular respiration happens in the mitochondria, often referred to as the power plants of the cell. Glucose is the body's preferred source of energy for the production of ATP but, if necessary, other carbohydrates, fats and proteins can also be metabolized to acetyl coenzyme A (CoA). enter the citric add (Krebs) cyde and be oxidized to carbon dioxide and water. (iii) succinyl-CoA can feed into either the respiratory chain or the Krebs cycle depending on the needs of the cell. In addition, the respiratory chain in the mitochondria also involves iron - sulphur (Fe - S) centres containing either two or four iron atoms that form an electron transfer centre within a protein. The serious consequences of profound vitamin deficiency have been recognized for more than a century. Mainly as a result of better general nutrition and of micronutrient supplementation in at-risk groups, the deficiency diseases, such as rickets, pellagra, scurvy and beriberi, are now relatively uncommon. at least in the developed world. But, within the past two decades, a number of onvestigators [11, 12] have re-introduced the concept of marginal micronutrient deficiency, first proposed by Pietrzik in 1985. This showed that, long before the clinical symptoms of deficiency appear, micronutrient deficiencies develop progressively through several sub-clinical stages (Table 2). Dietary magnesimn does not generally meet recommended intakes for adults. Results of a recent national survey in the USA, for example, indicated that a substantiol proportion of women do not consume the recommended doily intake of magnesium; with the menopause this problem increases among women over 50 years 0ld. The average magnesium intake for women was found to be 228 mg/day compared with the recommendation of 320 mg/day by the US Institute of Medicine. This avemge intolte amount was derived fium a l–day diet recall and, thus, may be an overestimate of actual magnesium intake. Groups such as pregnant women or the elderly must be mentioned, although they are not further considered in this review. Do the findings in athletes also apply to 'normal' people with only moderate physical activity? Young women at risk of micronutrient deficiency because of chronic dieting have been identified  and, in a subsequent paper, it was shown that the risk of deficienct was greatest in physically active women with preexisting marginal vitamin status. Indeed, both Manore  and Lukaski  identified the same high risk group, but from different perspectives: Lukasld studied athletes and identified an 'at risk' subgroup of young women who restrcted their diet;  while Manore studied chronic dieters and identified an 'at risk' subgroup who were physically active. Both authors concurred that multivitaminl mineml supplementation may be beneficial for such women. Finally, a generally well-recognized group for inadequate micronutrient intake is the elderly. Diet, micronutrient stntus and the benefits of supplementation have been much studied in the elderly, however most studies have concentrated on the effects of defidency on susceptibility to infection and, more recetly, cognitive function. However, lack of energy, tiredness, weakness and, paradoxically, loss of appetite are frequent complaints of older people. A recent study confirmed earlier pan-European findings that between 39% and 78% of elderly subjects had dietary intakes of vitamin A, calcium and iron below the lowest European RDA;  the relationship between micronutrient insufficiency and energy in this group warrants further study. As to how long to continue supplementation, the evidence suggests that an inadequate micronutrient status may take several weeks to develop and, once it occurs, it may take an equally long time to replenish body stores. Altbough data are limited, an experimental study showed that it took around 6 weeks for daily supplementation of vitamin B6 to restore optimum blood levels. Based on this and clinical data with multivitamin products, [52, 53] a treatment period of at least 40 days is usually recommended. An overwhelming body of physiological evidence confirms the fundamental role of vitamins and minerals in energy metabolism. In particular. the B complex vitamins are essential for mitochondrial function and a lack of just one of these vitamins may compromise an entire sequence of biochemical reactions necessary for transforming food into physiological energy. It is also clear that several minerals and trace elements are essential for energy generation, although more research is needed to elucidate their precise role. Inadequate intake of micronutrients, or increased needs, impairs health and increases susceptibility to infection, but may also result in tiredness, lack of energy and poor concentration. Besides generally accepted risk groups like the elderly, an important group who are at risk of an inadequate micronutrient intake – especially of the B vitamins – are young to middle-aged adults. These are often women with a demanding lifestyle who are physically active and whose dietary behaviour might be characterized by poor choices and/or regular attempts to lose weight. 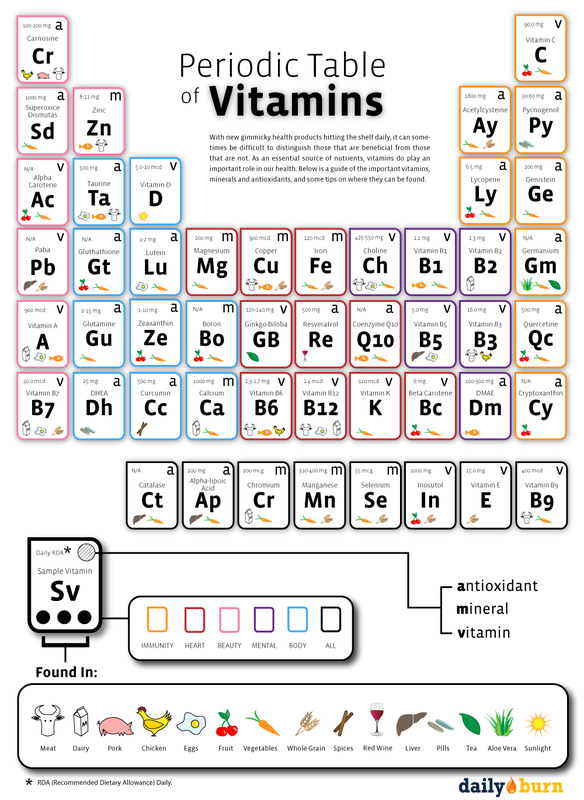 Given the importance of micronutrients for energy metabolism and the risk for an inadequate micronutrient status in otherwise healthy individuals, multivitamin-mineral supplementation is recommended for patients complaining of chronic lack of energy and in whom underlying disease has been exduded. Where such supplements are prescribed or recommended they should be taken for an adequate period of time, ideally not less than 6 weeks, to obtain a noticable effect on physical well-being. Silvia Moggini and Michael Ruf are employed by Boyer Consumer Care, a manufacturer of multivitamins.